Overdrive: Goodwood Festival of Speed breaks records : NOW WITH VIDEO! 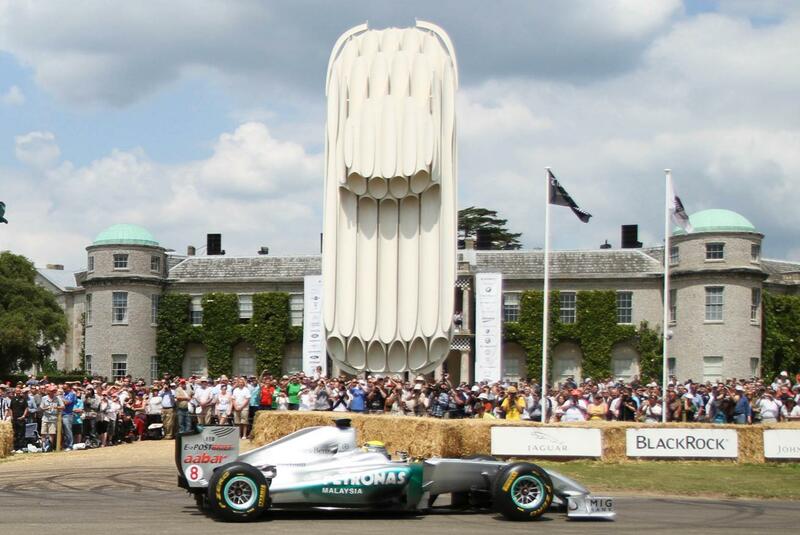 Goodwood Festival of Speed breaks records : NOW WITH VIDEO! With the annual Festival of Speed and Moving Motor Show now over for another year, Goodwood is reflecting on a truly exceptional weekend, which attracted a record 181,000 motor sport and car enthusiasts, as well as more than 100 star racing drivers and riders. Celebrated drivers tackling the Festival hillclimb included Lewis Hamilton, Jenson Button, Mark Webber, Nico Rosberg, Nigel Mansell, John Surtees and Sir Stirling Moss, making his first public appearance behind the wheel since announcing his retirement from competitive motor racing a few weeks ago. The 50th anniversary of the Jaguar E-type was marked with a jaw-dropping 28 metre-high sculpture of this most iconic of British sportscars. A large selection of Jaguars also took to the Hill as Goodwood celebrated 60 years since the Coventry marque first victory at Le Mans. 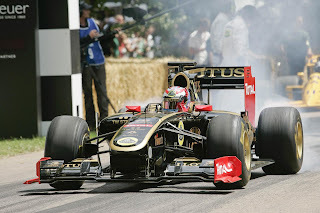 Among many 2011 Festival highlights was Sunday’s thrilling Top Ten timed shoot-out finale against the clock, with Dan Collins bringing this year’s event to a stirring conclusion with an epic performance in his Lotus 88B. 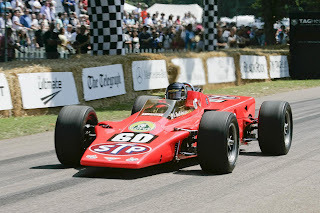 Times recorded in the opening first timed batch of runs were eclipsed by Andrew Willis in the wailing Matra MS670B with a time of 53.18sec, but this was just the warm-up act. Minutes later, Andrew Smith recorded a time of 50.03sec in his deceptively standard-looking Toyota Celica sprint car and neither Gary Ward’s Penske PC19 nor Paul Knapfield’s Brabham BT42 went faster. The weekend-long battle between GT star Michael Bartels’ Maserati MC12 and double British Rally Champion Jonny Milner’s Toyota Celica hillclimber failed to take into consideration Collins’ determination aboard his Lotus 88B ‘twin chassis’ F1 car. This radical machine practised but never competed in a Grand Prix in period, but Collins exploited the car perfectly to cut the timing beam at just 48.52 seconds. Goodwood staged a memorable tribute to the centenary of the Indy 500 race with 42 significant Indianapolis cars present, 33 of them lining up on the ‘grid’ outside Goodwood House and running up the Hill, driven by a host of famous Indy drivers and accompanied by some suitable pageantry, including a marching band, the singing of the traditional Indy song ‘Back Home Again in Indiana’, and guitarist Jeff Kollman playing the American national anthem up on the roof of Goodwood House. On Festival Sunday Queen guitarist Brian May joined in the celebration with singer Kerry Ellis and their Anthems band. What a way to finish a race! The Goodwood Cricket Pitch area received a major makeover for the 2011 Festival, being brought to life by GAS, The Goodwood Action Sports arena, presented by SEAT. GAS was home to some of the world’s greatest riders performing a series of gravity-defying tricks and stunts on everything from mountain bikes to motorcross machines. 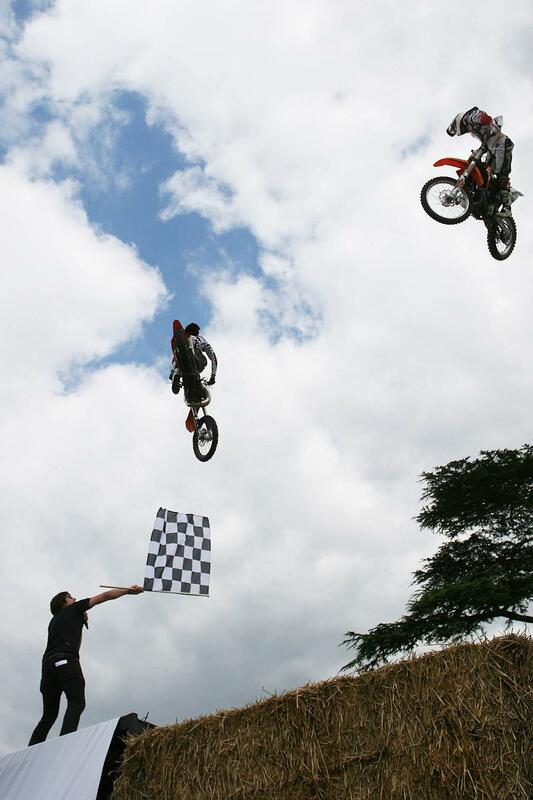 Among the daredevils mislaying their sanity were 12-times World Trials Champion Dougie Lampkin, X Games star Kye Forte, motorcycle long jump record holder, Robbie Maddison, who jumped a stupifying 332 feet, and Edinburgh’s own BMX bandit, Danny MacAskill. On a calmer note, David Cottingham’s sublime Touring-bodied 1951 Ferrari 340 America claimed overall honours in the Cartier ‘Style et Luxe’ concours d’elegance. Among the other winners, William Ainscough claimed the Boat-Tail Beauties category with his 1931 Bentley 4.5-Litre Supercharged Roadster, while Kees Smit’s 1937 Tatra T87 was a worthy recipient of the Extreme Lines prize for ‘Pre-War Streamlined Specials’. The People Power class went to the 1961 Renault 3 from the factory’s collection, with the Comeback Kids gong going to Maarten de Buijn’s 1999 Spyker Silvestris V8 prototype. From a vast variety of other Festival of Speed highlights, a few other notable moments included renowned stunt driver Terry Grant setting a new record in a Nissan Juke for driving up the entire 1.16-mile Goodwood hillclimb on two wheels, as well as breath-taking air displays from the Red Arrows and Vulcan bomber, a hugely popular Moving Motor Show, skillful sideways action up at the Forest Rally Stage, and a record number of supercar debuts, including the new Ferrari FF, Lamborghini Aventador and Jaguar XKR-S. Dates for the 2012 Goodwood Festival of Speed will be confirmed in the autumn, but motor sport enthusiasts needing their next Goodwood fix only need to wait another 11 weeks before the 2011 Goodwood Revival (16-18 September) gets underway. UPDATE : We've just found this video showing the amazing Gerry Judah Jaguar E-Type sculpture being built. It's fascinating viewing and well worth a watch.